Well, hallo, little shipboy! Do you want to be a Great Pirate Captain? Ok, here is your chance. Take this fort under your command and try to control waters using your cannons. Attack enemy ships, earn gold, upgrade your fort, buy new weapons, or even take Great White Shark a.k.a. Sea Monster under your control. 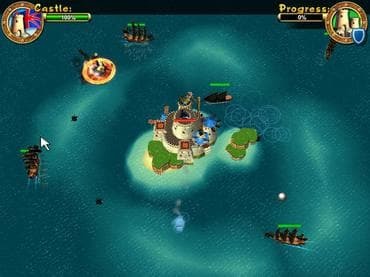 Download this free pirate game and enjoy pirates life! This is what Pirates: Battle for the Caribbean has to offer: - 2 Unique Campaigns: Play as a Pirate Captain or as a British Officer; - 30 Deadly Missions; - Survivial Game Mode; - Scores of Weapons and Power-Ups; - Stunning 3D Graphics & Shocking Sound Effects! If you have questions about Pirates game, please contact us using this form.